What is the QUARTILE.EXC Function? The QUARTILE.EXC Function is categorized under Statistical functionsFunctionsList of the most important Excel functions for financial analysts. This cheat sheet covers 100s of functions that are critical to know as an Excel analyst. It will return the quartile of a given data set based on percentile values from 0.1 exclusive. The function bases its calculation on a percentile range of 0 to 1 exclusive. As a financial analystFinancial Analyst Job DescriptionSee a real Financial Analyst Job Description including all the skills, experience, and education required to be the successful candidate for the job. Perform financial forecasting, reporting, and operational metrics tracking, analyze financial data, create financial models, QUARTILE.EXC can be used to find out a specific percentage of incomes in a population. The function is also useful in revenue analysis. Array (required argument) – It is the array or cell range of data values for which we want the quartile value. Quart (required argument) – It indicates which value will be returned. It is an integer between 1 and 3, representing the required quartile. If quart = 1 or 3, the supplied array must contain more than 2 values. It accepts three values for the quart argument: 1 (first quartile – 25th percentile), 2 (median value – 50th percentile), and 3 (third quartile – 75th percentile). 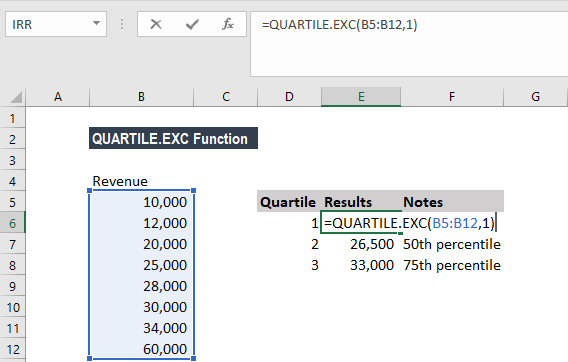 How to use the QUARTILE.EXC Function in Excel? Similarly, we could use 2 for the 50th percentile and 3 for the 75th percentile. The given array contains less than 3 values and the quart argument is equal to 1 or 3. #VALUE! error – Occurs if the given value of quart is non-numeric. 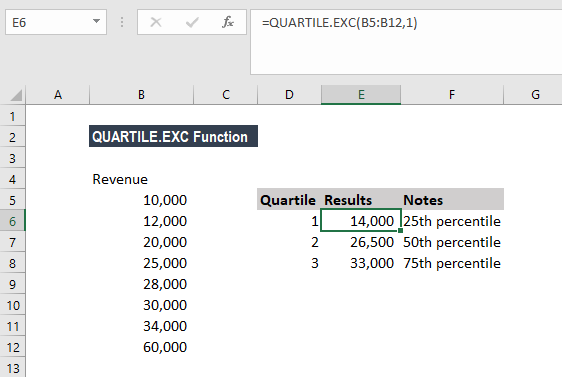 From Excel 2010, the QUARTILE.EXC and QUARTILE.INC functions would replace the QUARTILE function, which is now classified as a compatibility function. The QUARTILE.EXC function cannot calculate the 0’th or the 4’th quartile (as the calculation is based on the range 0 to 1 exclusive). 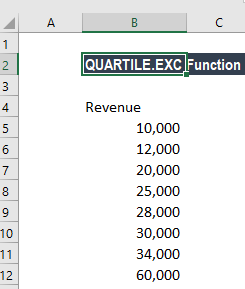 If the requested quartile falls between two of the values in the supplied array, MS Excel interpolates between these values to calculate the quartile value.